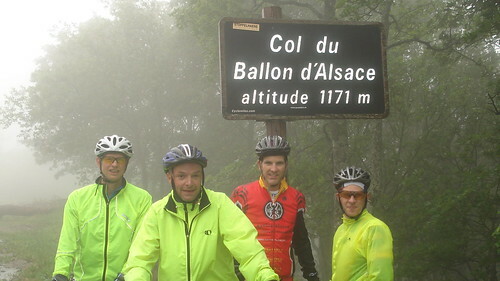 The Ballon d’Alsace was the first ever climb in the Tour de France – 1905 – and last appeared in the Tour in 2005 – the Tour graffiti is still all over the road. I was wrong! The Balloon d’Alsace was NOT the first mountain climbed in the Tour de France. The first over 1000m was the Col de la République, in 1903. Details here. 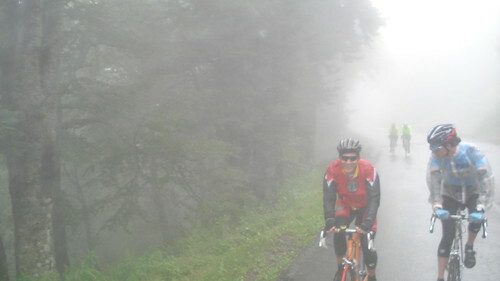 But the first Col was Col du Pin-Bouchain at 759 metres – see here. The weather continued to be awful and we debated long and hard whether to even get out of the car. But given the history of the climb, and the fact that these guys had crossed the ocean to ride here, we decided to give it a go but shorten the route. The plan was to climb the classic route then descend down the other side and climb back, but it was so cold, wet and miserable that we just did the one climb. A WINDY descent made the worlds slowest descender even slower.